« Driving to King’s Canyon N. P.
I reserved the cheap cabin on purpose, so I knew what I was getting into. No electricity, shared bath and shower house, canvas roof on cabin, many tiny cracks in walls. I am actually quite pleased. Aside from the rotting wood around the lock, meaning I’m not leaving anything valuable in there when I’m not, I am content. I was surprised to see bedding on my double beds, along with additional blankets, plus they provide soap and shampoo. It’s like a rustic motel, just I have a fluorescent lantern they gave me instead of a light switch! But I’m pooped. Five hours of driving, fitful sleep last night in my first night away from my bed plus a nice five mile hike at altitude. 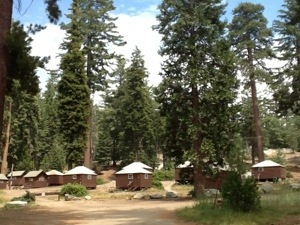 I need to rest to be ready for a full day in Sequoia tomorrow! By the way, even in July, it gets chilly up at altitude! Luckily I brought my zero dregree sleeping bag. Because one night it got very very chilly! I did want to have more layered clothing. Some days were overcast with some spitting and I would have liked to have more choices of layers. I was fine but I was looking the same each day I hiked.